The fairy boy has a few new tricks up his green sleeve. Contrary to rumors that surfaced when Nintendo first announced a new system in development, Skyward Sword is not being pushed back to a 2012 release to coincide with the system launch. Luckily for me, and any of you folks that are as excited as I am, we'll be holding it in our hot little hands this Holiday season. From the three demos I was able to play today, it's looking pretty darn good. The first part of the demo was Bird Racing. In this segment I was Link, not yet garbed in his trusty green tunic, vying for a trophy and the adoration of a casually dressed Zelda in a bird racing competition. Running off edge of a cliff of a mountain already in the sky and landing surely onto my trusty bird friend was exhilarating, and seamless. Once in the air, the objective was to catch the golden bird. At first, this was pretty straight forward, and easy, until the competitors start throwing eggs at you in the second round. Rude, but a nice acclimation from simple to complicated flying strategy. For those of you familiar with the horse racing in Ocarina of time, you'll be familiar with the idea of the feather gauge. At the bottom of your screen there are three feathers. Each time you spur your bird forward to charge you exhaust a feather, but they regenerate over time. Waving your controller up and down flaps your bird's wings, sending him up into the air. Pointing your controller at the ground sends him into a dive. Controlling direction was as simple as moving the Wii remote gently in the preferred direction. Catching the bird twice was the end of the sequence, after the trophy and the well-deserved adoration. After the bird racing was a dungeon sequence. Like previous demos , and likely because Link always starts his journey in a beautiful woodland, it was the forest dungeon. The dungeon demo timed out after 15 minutes, which felt like two, but it was 15 minutes packed with a variety of old Zelda mechanics mixed with some very interesting new ones. I've always thought that the handheld Zelda titles made bigger leaps with item innovation, but I'm pretty excited about this console outing. At one point in an outdoor section of the dungeon, there were red crystals to activate that opened the door to the next chamber. The first crystal was visible, and a well-shot arrow was the clear solution. This only opened one section of the gate, however, and I noticed a tunnel, high in the cliff face to my left with a clear entrance and exit, but no means of getting there. I shot a Beetle (a nice new item that works like a bombachu and a boomerang had a love-child) and guided it into the tunnel where a hidden crystal awaited. The next room contained a block puzzle in combination with an eye puzzle. Both staples of the series, but lovingly reworked. Previously, Zelda eye puzzles are solved by simply shooting the eye to blind it. This time, however, the eyes needed to be tricked into dizziness by dazzling them with fancy sword work. The block, instead of being used to trigger a switch, or give you access to a higher level, was really just an extra part of the eye puzzle. 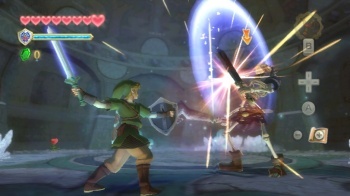 Mechanically, the control system, and the battle system are very similar to those in Twilight Princess. The trigger on the Wii remote contains your items, which in the demo were the crossbow, boomerang, bomb and beetle. The C button draws the item, and launches the bombs and beetles. To draw your bow, you hold C down, and pull back on the nunchuck, aim with the Wii remote, and release the C button to fire. Sword play is no longer simple as a slight wave in any direction to swing your sword. Now, your movements with the remote are directly translated on-screen. Slice side to side or up and down, or jab forward to stab. The familiar spider foe is dispatched by shooting his web with an arrow, then knocking him on end with an upward slice, and finishing him off with a jab to the sweet spot on his belly. Finally, I finished my demo with a boss battle against Ghirahim, a slender effeminate albino in pink argyle spandex. In the beginning, he taunts you. Approaching empty handed and slowly to gently raise his hand to you, he is patronizing and confident. He blocks your sword strikes with a bare, outstretched hand until you thwart him enough times with swift angle changes, at which point he arms himself with a formidable looking sword. Once armed he also disappears, only to reappear and strike. A pretty tough opponent for a demo, I blocked and swung my sword like a mad thing just to stay alive. I've been excited for this title for a long time, and playing it today only made it harder to wait for the holidays.